This bath melt recipe with emulsifier won't make your bath tub slippery like other bath melts. It's made with butters and essential oils to help relieve dry skin. We're having a beautiful summer this fall. I still have my air conditioning on in October. Trust me, I am not complaining. We have propane heat and use a fireplace for heat. The fireplace really zaps the moisture from the air, which makes my skin crazy dry. We set a pot of water on the woodstove to get moisture in the air, but it's not enough for my parched skin. Although it was in the low 80s today, the cold weather is coming. 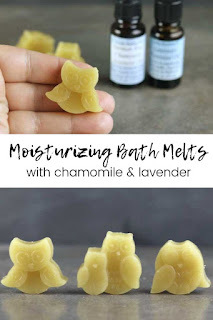 I'll be prepared this year with a homemade lotion for dry skin that will be coming in the next few weeks and recipes like this bath melt recipe with emulsifier for dry skin. Butters like shea butter and cocoa butter are wonderful for dry skin, but they don't mix well with water since they are oil based. Technically you could just use the butters and essential oils in this bath melt recipe, but they will just sit on top of the water. This means you won't get the benefits of this wonderful bath melt because all of the good ingredients will be floating above your body. That's why this recipe is different. I added an emulsifier so the oils and bath water mix together, so your skin gets the benefits of the butters. This also stops your tub from becoming a slip and slide, but you should still use caution when using a bath melt. Shea butter is my favorite butter for dry skin. It's high in vitamins that your skin loves like vitamins A, E, and F. It's also high in fatty acids that help moisturize your skin. Shea butter is very moisturizing for dry skin. It doesn't leave an oily residue, so it can help nourish your skin without leaving you feeling greasy. Shea butter is said to reduce inflammation thanks to cinnamic acid. It's also said to boost the skin's ability to produce collagen, so it may help reduce lines and wrinkles with long-term use. As I mentioned above, you don't need emulsifying wax in this recipe, but I highly recommend it. Without it, the butters melt and sit on top of the water. Your skin won't even get the benefits of using these DIY bath melts that way. Emulsifying wax is attracted to both water and oil (the butters). 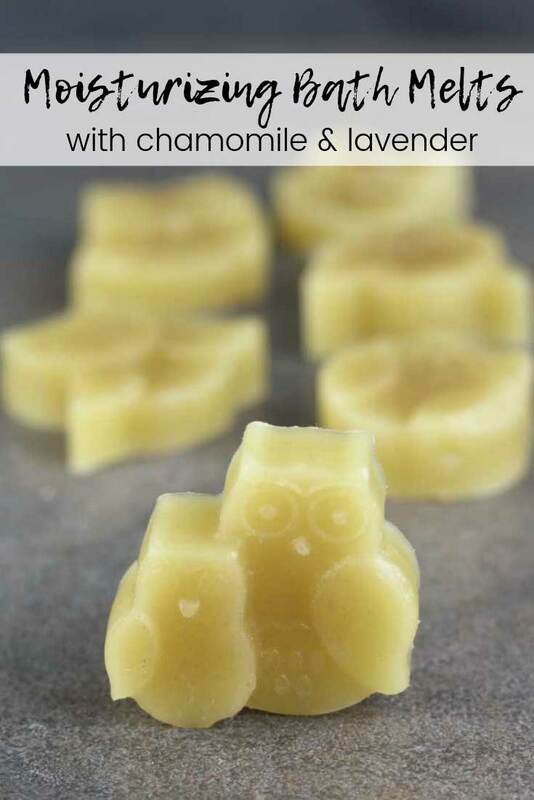 So when you drop these little bath melts into the tub, they melt and the emulsifying wax grabs onto the oil and the water to create an emulsion. There are several emulsifiers that you can use, but emulsifying wax is by far the most popular and easiest to use. I bought my emulsifying wax at an Amish bulk food store, so I don't know what brand it is. I really have to stir it when it's melted to get it to blend well. I've heard that this happens with other brands, too. So be sure to stir for a few minutes before pouring so it can really get mixed together. Although shea butter is my favorite butter to use, cocoa butter is a close second. It's high in antioxidants to help your skin. Cocoa butter is very moisturizing, so it's a great product to use on dry skin. It can both prevent dry skin and treat it, so I use it often in the winter months. Cocoa butter is a mild butter, so it's generally safe to use on irritated skin or on eczema. I chose german chamomile essential oil and lavender essential oil. Lavender essential oil is naturally nourishing thanks to its antioxidants. It's also said to help the skin heal, which is good if your skin is irritated from being dry. Lavender essential oil is also a natural anti-inflammatory to help your dry skin. I used german chamomile because it's so great for dry skin. It's a strong anti-inflammatory, which is important for irritated skin. It's also a natural antiseptic. If you scratch at your dry skin, you could be introducing bacteria and other germs into small cuts. This essential oils can help reduce the risk of infection. 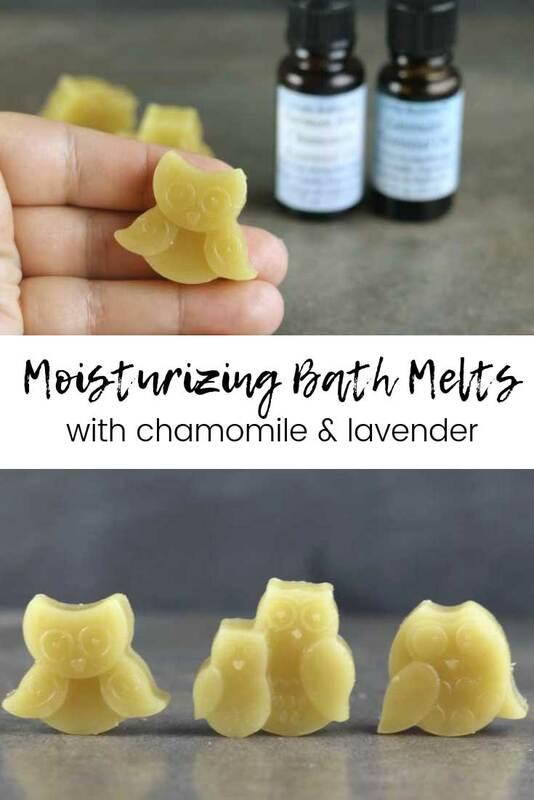 I used an adorable owl mold for these bath melts. Each owl weights approximately 0.38 ounces, so they are small. You definitely want these bath melts to be small. A little bit of shea and cocoa butter go a long way. If you use a big mold, you'll have too much oil in the water, and you'll just be wasting it. This is the mold that I used, but you can use any mold that you'd like. I recommend using two of these little owl per bath, so try to aim for a bath melt that measures 0.5 to 0.75 ounces per bath melt. Weigh each ingredient with a digital scale and place in a double boiler or Pyrex measuring cup. This recipe doesn't make a lot, so you can use a 2-cup measuring cup . Heat in a double boiler until melted. Or microwave at 30 second intervals until melted. I microwaved mine for 30 seconds. It was nearly melted, so I stirred it until it was all melted. Let it cool to about 180 degrees. I use a laser thermometer to check the temperature. Carefully pour into a silicone mold. Let sit until hard, about an hour. Carefully remove from the mold and store in a container with a lid. These are solid, but they are soft and can dent. Use one or two small bath melts per bath. Each owl in this mold is 0.38 ounces, so I would use two melts this size. This recipe made six 0.38 ounce owls or 2.28 ounces of bath melts. Bigger isn't always better. These are fairly potent, so you only need 0.5 to 0.75 ounces of bath melts per bath. If you have dry skin, sign up for my newsletter because I'll be posting more DIY recipes and other information about preventing and treating dry skin. Not ready to DIY? 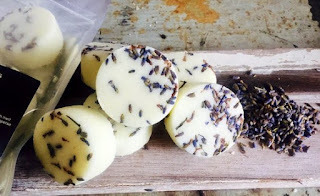 Try these lavender bath melt from The Plant Lab Bath and Body on Etsy.